Pixel Pals Coming Exclusively to GameStop This Black Friday | Nerd Much? In case you needed more collectibles to adorn your shelves, allow us to introduce you to PDP’s new Pixel Pals. Pixel Pals are figures of iconic video game characters rendered in an old-school, pixelated art style. And, as if they didn’t look cool enough already, they also light up. Each freestanding figurine is approximately 6″ tall with an on/off switch and battery compartment in the back (and never fear, the two required AA batteries are included in the box). They are made of a lightweight plastic, seem to be fairly sturdy, and are stable enough despite not having a base of any sort. They emit a soft glow that would make them ideal for use as a night-light or desk accessory. 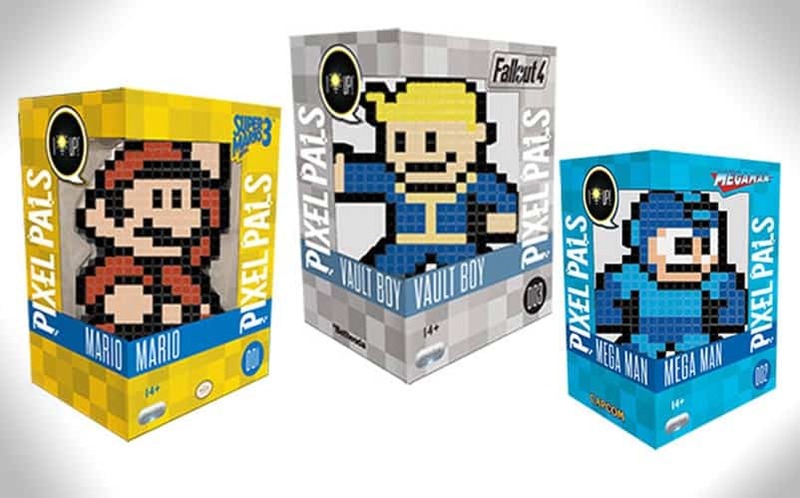 The initial lineup of officially-licensed Pixel Pals includes Mario from Super Mario Bros. 3, Mega Man, and Vault Boy from the Fallout series, numbered 001-003 respectively, with plans to add more characters in the future. They are scheduled to launch on Black Friday, November 25, exclusively at GameStop and will retail for $14.99 each. We love the retro look of these figures, and can’t wait to see the next wave of characters. Our choices would probably have to be Link from Zelda, Ryu from Street Fighter, and maybe one of the classic Final Fantasy sprites. Which characters would you like to see? For more cool nerdy stuff to buy, stay tuned to Nerd Much?.